As a New Yorker, I have been under the misapprehension that I walk a lot, but it’s nothing compared to the walking the hardy Caprese do. Young, old, disabled (! ), it appears they walk miles on a daily basis without a thought—uphill, up cliffs! Of course, they have cars, too, and they surely have the best driving skills in the world to maneuver the extremely narrow roads and the hairpin turns. One of the tricks, I think, must be not to look out at the view because the vertigo would surely send you over the edge. Another trick must be patience. Numerous times I have seen two cars—or buses—coming at each other and they must come to a halt in the middle of the road and somehow, without an angry word or threatening glance, they decide who needs to back up so one can get through. I can’t imagine the Capri driving test. Also, as in the rest of Italy, motorbikes abound. I’ve seen one going up the cliff with two kitchen chairs tied to the back of his bike. At a pizzeria, I saw a man pick up three pizzas and ride off with them balanced upon his lap. Another man at the pizzeria had his girlfriend along for the ride and she held the boxes in two hands rather than hold on to his waist. A family of three rode another bike and, perhaps most unusual of all, I noticed a biker riding with what appeared to be a four-foot long samurai sword rising up from between his legs. But it’s walking I wanted to talk about. In Capri, I walked almost everywhere. 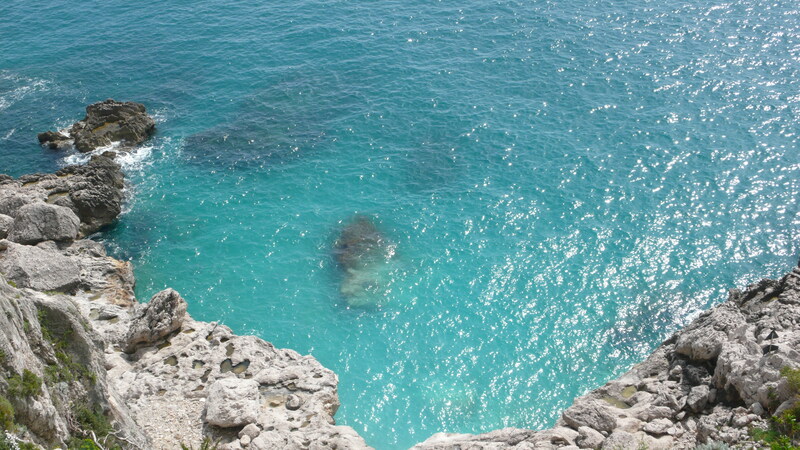 From my hotel to the Grotta Azzurra, from Capri Centro to Giardini di Augusto and winding all the way down to the coast along the spectacularly scenic Via Krupp, from Anacapri Centro to back to my hotel…many times. One morning, I climbed up to Villa Jovis, the ruins of a villa built by the Emperor Augustus and later ceded to Tiberius, who purportedly pitched people who displeased him from the dizzying heights into the sea—that is, when he wasn’t cavorting with young boys and girls. Because it is off-season, I saw perhaps three people on the half-hour or so climb from Capri town center. (If I’m honest, a bit longer for me, because I tend to get lost.) 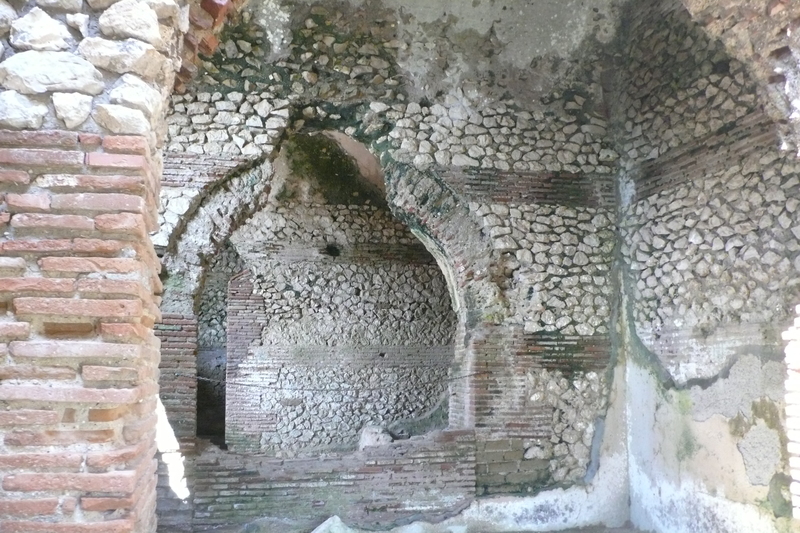 The ruins evidenced a shockingly enormous complex, but the views were the real draw. I had definitely earned my planned lunch at what had once been Graham Greene’s favorite restaurant, Da Gemma. As luck would have it, it had opened for the season just today. But more on that another time. My blog has been delayed by some technology issues here in Anacapri, a small price to pay for the privilege of spending three days in such a remote area of an island that boasts some of the most heart-stopping vistas I’ve ever seen. Where does the sea end and the sky begin? I find myself wondering. Along with: I never knew what blue was till now. Because in Capri, you are forced to redefine the color. Getting here, however, had its challenges. My flight from New York to Rome went smoother than you can possibly hope for or expect in 2010, making my $800 ticket seem a bargain (we’ll see what happens on the flight home!). But following eight plus hours in the air, never sleeping a single minute of it, I felt a bit over-stimulated navigating my way through the train station at Fiumicino with my luggage, onto the jam-packed train, and into Termini Station. The train to Termini left 15 minutes late, the Eurostar from Termini to Naples half an hour late. Then, Naples. Half an hour there may have given me a bad first impression, but the chaos, the filth, the squalor, the angry people. There was the cab driver who had me follow him quite a long way to his car from the station, without offering any help with my bags, and took off like a sprinter. He then had me sit in the front seat with him and as soon as we were underway, he stopped for gas, during which he started a fight with the station attendant, gesturing in that mildly violent way I’ve always thought of as an Italian stereotype. When we had reached my destination—the Molo Beverello port—and I could pry my fingers from the dashboard (I thought driving in Manila was bad! ), he now told me the fare was 25 euros as opposed to the 20 he quoted me at the train station. “Big traffic,” he said, which was the same thing he said to explain the initial fare of 20 euros. I feel like a sucker now for actually giving him 23, especially after I realized he had dropped me off several blocks from the port! Let’s just say that the hunched over beggars tugging on my jacket, the cars and motorcycles trying to run me down, the litter in the streets didn’t give me the best impression. Nor did the ticket office, where two men outside watched conspicuously as I struggled to navigate my suitcase through the closely spaced blocks of concrete, but never offered to help. The ticket man was gruff, seemingly annoyed that I asked him which of the several docked boats was the one to Capri. My smiles and buon giornos were not working their usual charm! Maybe if I’d been less tired…? But I did make it to Capri, and an extremely friendly taxi driver and possibly the best driver in the world maneuvered up and around the cliffs to Anacapri on the far western side of Capri. 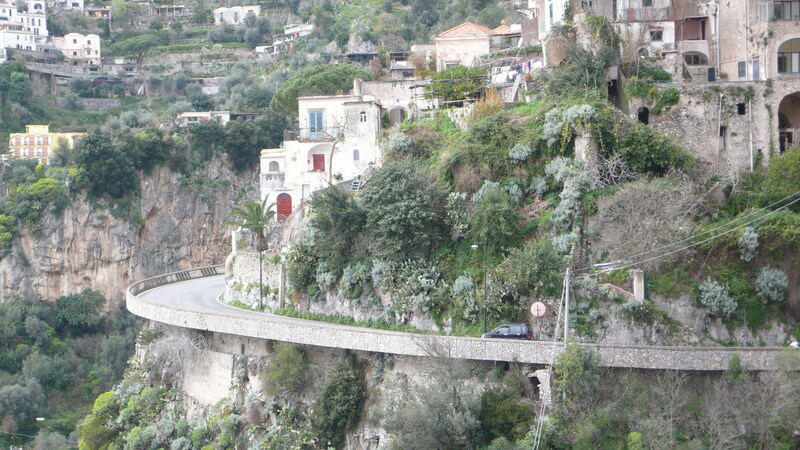 Hairpin curves, narrow roads that at home would have to be one-way but were two-way here, the dizzying heights, the striking blueness of the sea below—way below—no better word to describe it than WOW. Benevenuto Capri. Happy birthday to me. What a thrill it once was to go to the airport! When I was a child, JFK was a destination in and of itself–its hordes of luggage-laden travelers dressed for every season on the planet, conversing in myriad languages, gesticulating according to their customs. Women in silk saris, men in designer suits, backpackers in jeans and t-shirts…here, the world was represented in all its fascinating diversity. There was a glamor to the idea of flying on an airplane. We checked our luggage with a skycap at the curb, we bought snacks and magazines at the newsstand by the gate, we boarded ontime and settled into our seats, excited for the trip, but also for the experience of takeoff, flying 35,000 feet above our home and landing, miraculously, in a place perhaps very different from the one we’d woken up in that morning. The stewardesses (not yet flight attendants) smiled at everyone and gave us children coloring books. They brought food–for free!-which wasn’t very tasty, yet was anything cooler than eating a hot chicken parmigiana meal while flying high above earth in an enormous metal bird? Now, an hour before the car picks me up to take me to JFK, as excited as I am for my trip, I am dreading running the airport gauntlet. Will my suitcase come in under the weight limit? Will I breeze through the security line after removing my shoes from my feet, my belt from my waist, my laptop from its case? Will they find it in their hearts to let me carry on a laptop, a Timbuktu bag and a purse? And the biggie: will the plane be on time? I am due to arrive in Rome at 7:25 a.m. (Rome time). From the airport, I will take a taxi to Termini Station, from which I will travel on Eurostar to Naples. In Naples, I will cab it from the train station to the port, where I will board a hydrofoil to Capri. From there, a ride (haven’t nailed this down yet) to the other side of the island–to Anacapri–and I will have finally reached my first destination. There are a bunch of legs involved here, and I’m travelling alone this time, so I admit to being slightly nervous while assuming things will go smoothly. Next time you check in here, I’ll be in Anacapri (18th), celebrating my birthday. Ciao for now! I admit it: I’m a big planner. Generally my detail orientation and organizational prowess are quite handy, even desired skills, and yet I’ve learned–both in planning my life and in planning trips–that sometimes you need to let go. It’s not necessary to plan every single moment of your day. While this may seem obvious to you, for those of you reading this who are just like me, you know what a revelation this is. When I’m travelling, though, I am far more relaxed than I am at home and have always had an easier time giving myself up to the moment. Yes, I do my destination research beforehand, and I do purchase the museum tickets and make a reservation or two before leaving home, but I also allow for flexibility and even whole chunks of free time. And this is where Serendipity often seizes its opportunity. 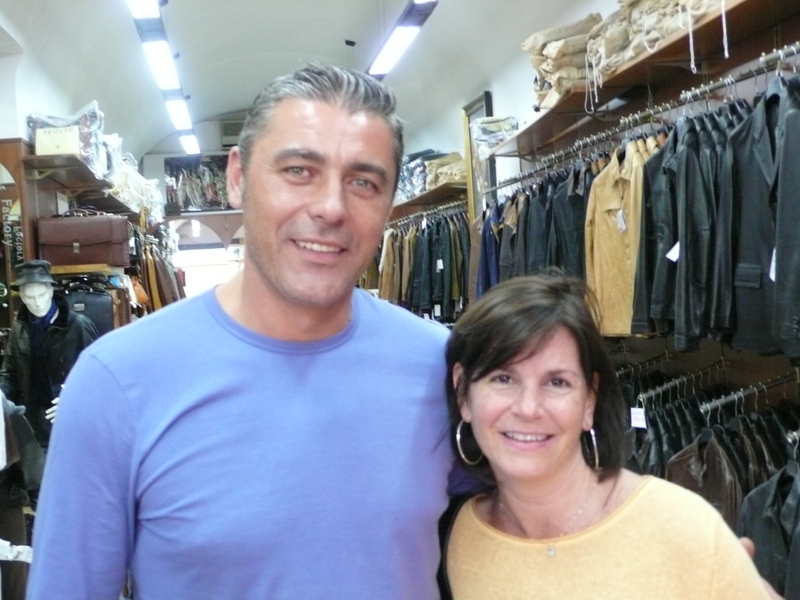 Aurelio looked to be George Clooney’s taller, better looking, younger brother. Seductively slumped against a Vespa, smoking a cigarette as if he were whispering sweet nothings into its ear, wearing a blue sweater that was only almost as blue as the inviting sky of his eyes (I could tell even from a distance, so piercing were they!). No boots, but jackets, bags, and other objets d’leather and nothing, really, that I wanted to buy or could afford. While I browsed, Ken struck up a conversation with Aurelio and we wound up chatting with him for about 45 minutes. We even took his picture! When we were finally ready to leave, I had one last question for Aurelio. Where does he eat in Florence? Because we had been trying to find a restaurant frequented by locals, not tourists–not the easiest of undertakings in a city like Florence. 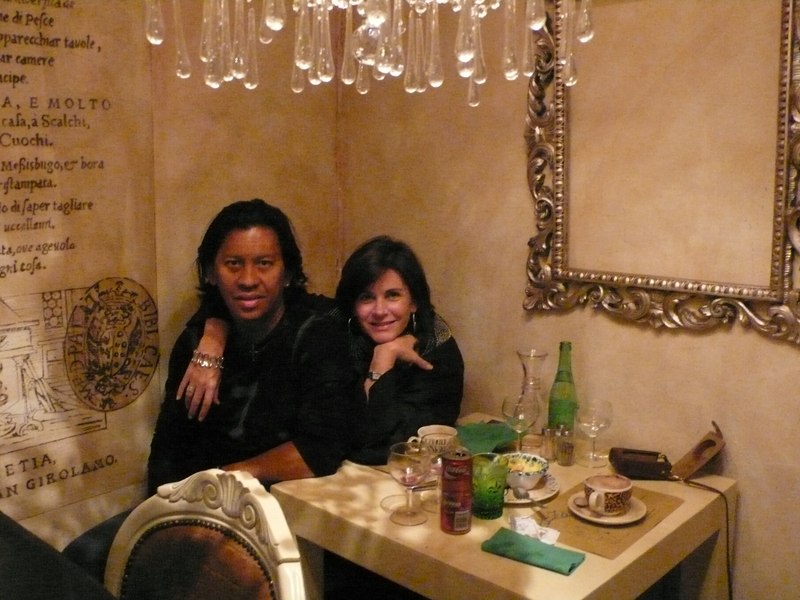 While he demured that he rarely eats out because his wife (drat!) is such an exemplary cook, he did give us a suggestion. Not only did he provide us the name, but he drew us a map from our hotel to the restaurant and even told us what to order. We followed his instructions and ordered what he told us (a good thing, since the menu had no English and our waiter wasn’t exactly bilingual) and it was hands-down the best meal we had in Florence, if not on our entire trip in Italy. More than two years later, at the mere mention of the phrase bistecca fiorentina, I can taste the garlic and lemon and olive oil sizzling on my tongue, and everything about that magical night in Florence comes flooding back: the warmth of the late September evening, the strings of lights dancing in the breeze, the desolate cobblestone street we strolled down, my shoes in my hand, the moon our only eyewitness. For such Proustian memories as these can we thank Serendipity. One week from now, I’ll be leaving for a two-week sojourn in Italy, traveling first to Anacapri, then to the ankle area of “the boot,” otherwise known as the Amalfi Coast–specifically Positano, and wrapping up with a few precious days in Rome. The occasion? 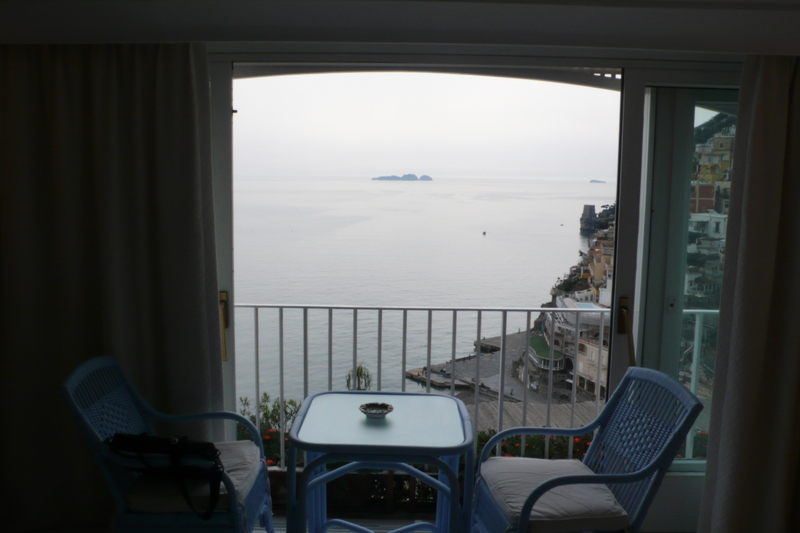 A week-long writers conference in Positano (I’m a fiction writer, currently working on a novel – www.judepolotan.com ). And if you’re already going to the expense of traveling to Italy, you may as well make the most of it, right? While I have always been big on anticipation, perhaps because I have been particularly over-committed as of late, this trip has sneaked up on me. But sneaked up on me it did this past weekend, and as always, I am filled with this sense of I-can’t-believe-I’m-going-to-[insert destination]-it-seems-unreal! It may seem unreal, but I can’t wait. When I should be working on my novel or paying my bills, instead I’m surfing the Internet for information on hiking in Capri or the perfect off-the-beaten-path restaurant in Rome. I’m making lists of what to do (get euros! call credit card companies!) and of what to bring (adapter, travel journal, walking shoes for cobblestone). I’m reading a guidebook and travel literature about Italy (Pagan Holiday by Tony Perrottet). I’m reliving my last trip to Rome by poring over old photographs. I wake up excited each morning now, counting down the days in my head. The days leading up to a trip are more hectic, but also happier than other days. Like Christmastime when you were a kid, but the “gifts” are better! I’m reminded of an Australian woman for whom I once worked. She’d travelled to virtually every country in the world. Everytime she was going on a trip–Kenya, Morrocco, Vietnam, Tibet–I was beside myself with envy. (Paradoxically, she afforded her employees little vacation time.) I thought I could at least live vicariously through her anticipation and I would arrive at the office in the mornings and say to her, “Are you getting excited?” But she never really was. She was looking forward to the trip perhaps, but her attitude was blase, world weary. I was disappointed, but I also felt sorry for her. My profound hope is that, no matter how much I travel, the jittery anticipation I feel before taking off for a distant land never leaves me. Anticipation is an integral part of the fun, a part I truly savor. In this recent article for WorldHum (http://www.worldhum.com/features/eric-weiner/why-tourism-is-not-a-four-letter-word-20100301/), Eric Weiner chides those who look down on “tourists” and “tourism,” deeming themselves (“travelers”) as superior. As one of those who considers herself a “traveler” and who owns a company designed specifically to “transform tourists into travelers,” I’d like to weigh in on the topic. First, there is nothing in Weiner’s article I disagree with–it is true that communities, cities, entire regions of the world depend upon tourist dollars for survival and no one wants to take those dollars away from them. It is also true that on a first trip to Paris it would be a travesty not to see the Eiffel Tower, nor would you want to skip the Statue of Liberty in New York, the Colosseum in Rome, the Taj Mahal in India, the luau in Maui, etc., etc. What I believe, however–and what Oink and Away! advocates–is some level of cultural immersion. In addition to the checklist of major tourist sites and museums, experience the culture by eating at restaurants frequented by locals, by exploring local markets, by spending a Saturday night at a popular music club, by taking a class at a cooking school or attending an art exhibit at a gallery. Learn a few words of the language and engage the people who live there in order to gain a perspective on their lives, discovering both your differences and your commonalities. The typical perception, I think, is that travelers are curious and want to blend in whereas tourists are less sensitive to cultural differences and do not always take care to understand some of the customs of the destination. Torn jeans and sneakers or chino shorts paired with a Hawaiian shirt and knee socks is not appropriate attire for, say, Milan. The cliche of the Ugly American Tourist has been subsiding, but it has existed for a reason. As with everything, the key is balance. See those monuments, attend those cultural shows, but also try to go deeper and really soak the place in. In the end, it’s semantics. 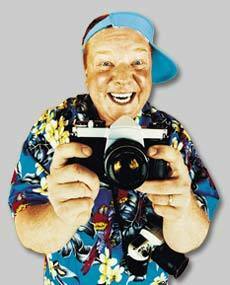 Tourist, as Weiner affirms, is absolutely not a dirty word, but its connotation can be. The good news is, we can change that. Cliche, perhaps. Too many tourists, oh sure. 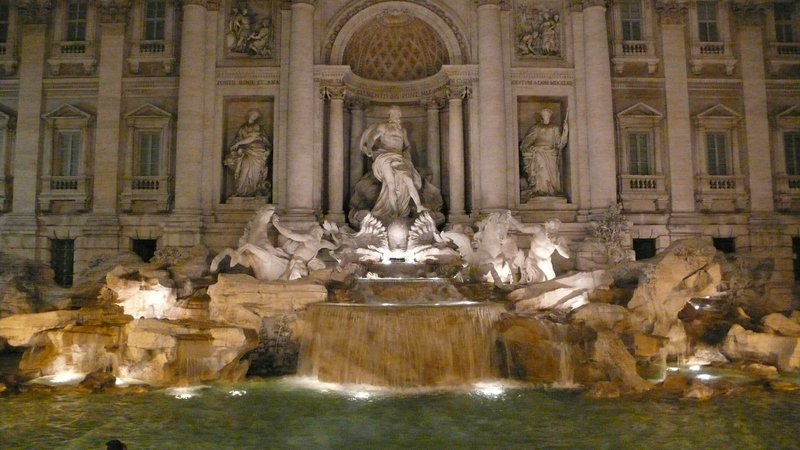 But during my trip to Rome in 2007–my first–I wouldn’t go back to the hotel for the night until I’d gazed upon the Trevi Fountain yet again–it is that beautiful. Best yet, a tiny cafe on a corner nearby had what I thought was the best macchiato in town. Of course, I threw more than one coin into that fountain and here I am, returning 2-1/2 years later. So now I’ve got a blog in which I can share my musings on all things travel. Stay tuned in the coming weeks as I share my adventures in Italy. 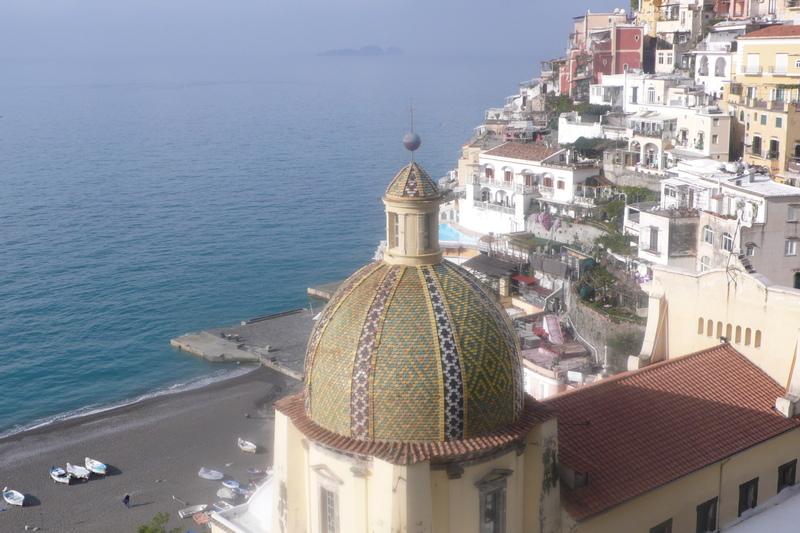 I leave for Anacapri on 17 March, then onto Positano, winding up in Rome.